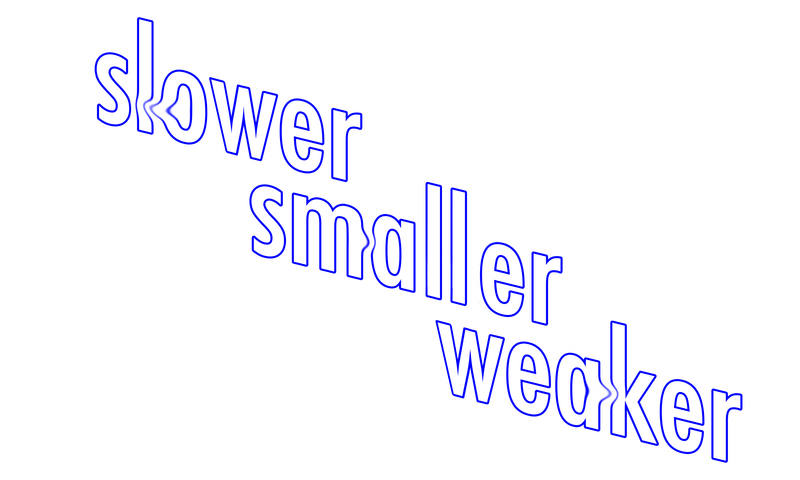 Slower, Smaller, Weaker is an apexart Open Call Exhibition. The project's title Slower, Smaller, Weaker derives from the inverted Olympic motto and is charged with contradictory meanings. On one hand, it signifies the current economic and social decline, and deteriorating conditions of contemporary Greek society; on the other hand, it is allegorical and indicates the need for evaluation and reflection on what profit and competition-driven systems do. The exhibition will take place in one of the buildings of the Olympic Village of Athens. The Village, originally built to house the 2004 Olympic athletes, is now home to 2,500 low-income families. An isolated place, it has empty streets and hardly any evidence of public life, abandoned by the state. In contrast to the euphoria of the beginning of the millennium, this Village can be seen as a symbol of failure of many existing national hopes. At the same time, it is a place where many volunteers and multiple residents’ associations are self-organizing, offering an encouraging example of community mobilization. The exhibition will feature new works from eight Athens-based artists and artist groups, created in response to the curatorial theme. Slower, Smaller, Weaker aims to create a platform for discussion and collaboration, and invites artists and filmmakers to mobilize multiple Village spaces by creating conditions for encounters and communication. Special thanks to Giorgos Nikas, co-author of the original open call proposal for Slower, Smaller, Weaker, submitted to apexart in February 2017. Alexandra Streshna (b. 1987, Lviv, Ukraine) is an Athens-based painter and independent curator. Instrumentalization of historical testimony, artificiality of fundamental truths, and the process of myth-making are some of the recurring themes in her practice. She studied at the Athens School of Fine Arts and received a master's degree in fine art from Central Saint Martins, London.